2018 – Page 2 – Midnight Sun Mining Corp.
Vancouver, British Columbia, May 30, 2018 – Midnight Sun Mining Corp. (the “Company” or “Midnight Sun”) (TSX-V: MMA) has completed the second and final tranche of its previously announced non-brokered private placement by issuing 2,082,400 units (the “Units”) at a price of $0.32 per Unit for gross proceeds of $666,368. Each Unit consists of one common share (“Common Share”) in the capital of the Company and one-half of one Common Share purchase warrant (“Warrant”). Each full Warrant entitles the holder to purchase one Common Share of the Company for a period of twelve months from closing, at an exercise price of $0.48. Finder’s fees of $24,960 will be paid in cash and 78,000 Finder’s Warrants will be issued in connection with this tranche of the private placement. Each Finder’s Warrant will entitle the holder to purchase one common share at a price of $0.48 for a period of twelve months, expiring on May 28, 2019. Insiders of the Company have subscribed for 782,400 Units in this tranche for gross proceeds of $250,368. All securities issued pursuant to this tranche, including the Common Shares underlying the Warrants, are subject to a statutory hold period which expires on September 29, 2018. In total, the Company issued 3,453,963 Units for gross proceeds of $1,105,268. Finder’s fees of $43,704 will be paid in cash and 136,575 Finder’s Warrants will be issued in connection with the Private Placement. In total, Insiders of the Company purchased 807,400 Units for gross proceeds of $258,368. The net proceeds of this offering will be used by the Company to fund further exploration work on its Zambian mineral properties as well as general working capital. The completion of this private placement remains subject to final acceptance by the TSX Venture Exchange. Vancouver, British Columbia, May 15, 2018 — Midnight Sun Mining Corp. (the “Company” or “Midnight Sun”) (TSX-V: MMA) has completed the first tranche of its previously announced non-brokered private placement by issuing 1,371,563 units (the “Units”) at a price of $0.32 per Unit for gross proceeds of $438,900. Each Unit consists of one common share (“Common Share”) in the capital of the Company and one-half of one Common Share purchase warrant (“Warrant”). Each full Warrant entitles the holder to purchase one Common Share of the Company for a period of twelve months from closing, at an exercise price of $0.48. Finder’s fees of $18,744 will be paid in cash and 58,575 Finder’s Warrants will be issued in connection with this tranche of the private placement. Each Finder’s Warrant will entitle the holder to purchase one common share at a price of $0.48 for a period of twelve months, expiring on May 11, 2019. Insiders of the Company have subscribed for 25,000 Units in this tranche for gross proceeds of $8,000. All securities issued pursuant to this tranche, including the Common Shares underlying the Warrants, are subject to a statutory hold period which expires on September 12, 2018. Vancouver, British Columbia, April 25, 2018 – Midnight Sun Mining Corp. (the “Company” or “Midnight Sun“) (TSX-V: MMA) has commenced its exploration program for the 2018 field season. The Company has designed a comprehensive exploration program to further advance its Zambian copper properties. The Company has mobilized the first diamond drill rig to the Solwezi Group of Licences (“Solwezi Licences”) and will start operations in the next two weeks. The second diamond drill rig is currently at the Zambian border and should be at site in two weeks’ time, commencing work shortly thereafter. A team of seven geologists and data management personnel are on the ground and have completed the re-logging of all historic drill core to facilitate a strong comprehension of the geology and controls on mineralisation at the Solwezi targets. This knowledge will support optimization of drill holes in the upcoming program. Additionally, the Company has introduced robust QA/QC procedures for all work programs. A Natural Sourced Audio Magneto Tellurics (“NSAMT”) ground geophysics programme over the north-west area of the Mitu copper-cobalt target has been completed by Symons Geophysics, with a total of 35 line kilometres surveyed. This survey was conducted on 500 metre spaced lines with the goal of providing a more detailed view of the position and distribution of the favourable black shale units which host the identified copper-cobalt mineralization. A final interpretation and model is expected in approximately three weeks. The Company has also contracted GeoTech Ltd. to fly a 200 metre spaced airborne geophysics survey, including Heli-borne Versatile Time Domain Electromagnetics (“VTEM”), magnetics and radiometrics over the entire property, with 100 metre spaced infill over the three main targets of Mitu, 22 Zone and Dumbwa (north and central). The survey should commence in the third week of May, subject to weather conditions at site. Midnight Sun will utilize the new data generated from these VTEM and NSAMT surveys to conduct a comparative interpretation using the exploration dataset, including the drill data from its 2016 and 2017 drilling campaign, early 2018 drill results, and soil geochemistry. This will help determine primary and secondary drill targets on the three main mineralized areas. In particular, the survey can identify the position of additional black shale units along the Mitu corridor and at depth below the limestones at 22 Zone, where the Company sees potential for mineralization analogous to that found at the neighbouring Kansanshi Mine (First Quantum Minerals). The Company will also mobilise an air core drill rig to Mitu in late May to evaluate the intensity of copper-cobalt mineralisation in the conductor rocks. This will guide the diamond drill holes to focus on testing the most significant and sizeable mineralised conductors and leverage the overall exploration program towards the discovery of significant mineral resources. The Company announces a non-brokered private placement of up to 3,750,000 units (the “Units”) at a price of $0.32 per Unit for gross proceeds of $1,200,000 (the “Offering”). Each Unit will consist of one (1) common share (“Common Share”) in the capital of the Company and one half of one (1) Common Share purchase warrant (a “Warrant”). Each full Warrant will entitle the holder to purchase one Common Share of the Company for a period of twelve months from the closing of the Offering at an exercise price of $0.48. The net proceeds from the Offering will be used by the Company to fund exploration on the Solwezi Licences as well as general working capital. The Company intends to close the Offering as soon as practicable. Brett Richards, Chief Executive Officer of the Company, has again committed to participate in the private placement as the lead order, personally subscribing for $200,000 worth of units. Midnight Sun Mining Corp. is a mineral exploration and development company that trades on the TSX Venture Exchange under the symbol MMA. Midnight Sun has earned a 60% interest in the Solwezi Licences, and has since agreed to a term sheet and letter of intent to purchase the remaining 40%. 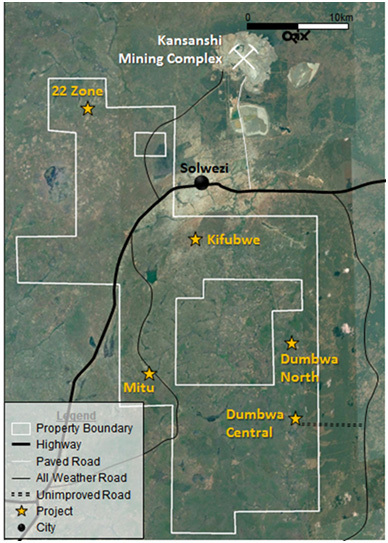 The Solwezi Licences are adjacent to First Quantum’s Kansanshi Mine; Africa’s largest copper mining complex, on the prolific Zambia-Congo Copper Belt. 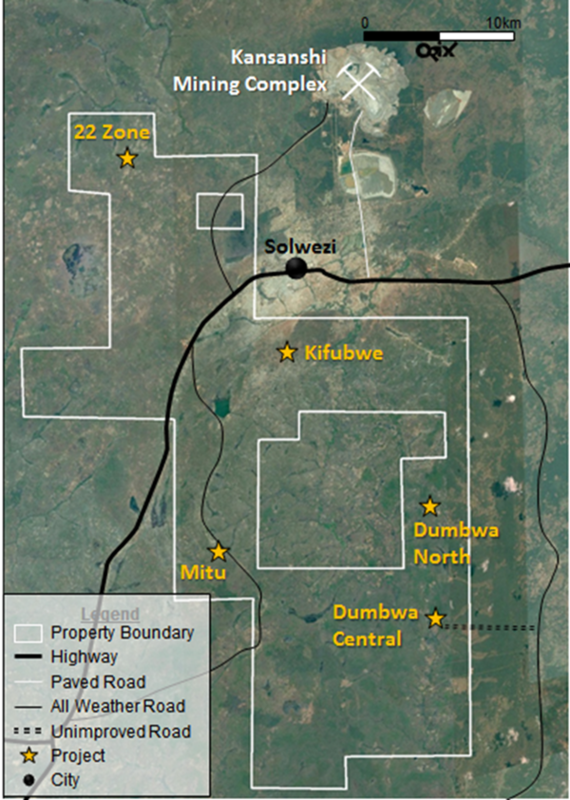 The Solwezi Licences are comprised of two (2) individual prospecting licences totalling 506 km2, located in the North-Western Province of Zambia approximately 450 km from the capital city, Lusaka. Led by experienced directors and talented management, Midnight Sun aims to further explore the impressive mineralization and anomalies that have recently been discovered on the Solwezi Permits. This news release includes certain statements that may be deemed as “forward-looking statements”. All statements in this release, other than statements of historical facts, the expected completion of any Offering, and the expected use of proceeds are forward-looking statements. Although the Company believes the expectations expressed in such forward-looking statements are based on reasonable assumptions, such statements are not guarantees of future performance and actual results or developments may differ materially from those in forward-looking statements. Factors that could cause actual results to differ materially from those in the forward-looking statements include: changes in market conditions, unsuccessful exploration results, changes in the price of commodities (particularly copper, cobalt, gold and nickel), unanticipated changes in key management personnel and general social, economic or geo-political conditions. Mining exploration and development is an inherently risky business. Accordingly, the actual events may differ materially from those projected in the forward-looking statements. This list is not exhaustive of the factors that may affect any of the Company’s forward-looking statements. These and other factors should be considered carefully and readers should not place undue reliance on the Company’s forward-looking statements. The Company does not undertake to update any forward–looking statement that may be from time to time by the Company or on its behalf, except in accordance with applicable securities laws. Vancouver, British Columbia, February 20, 2018 – Midnight Sun Mining Corp. (the “Company”, “MMA” or “Midnight Sun”) (TSX-V: MMA) is pleased to announce that it has signed a binding letter of intent and term sheet (the “Binding Letter and Term Sheet”) with Kam Chuen Resource Holdings Inc. (“Kam Chuen”), its joint venture partner in Zambian High Light Mining Investment Limited (“ZHLMIL”), to acquire the remaining 40% interest in ZHLMIL (the “Purchased Shares”). Midnight Sun previously satisfied its obligations under the Option Agreement with Kam Chuen, originally announced on November 29, 2013, pursuant to which it acquired a 60% interest in the Solwezi Group of Exploration Licences (the “Licences”) from Kam Chuen, as shown in Illustration 1.0 – The Solwezi Group of Licences. 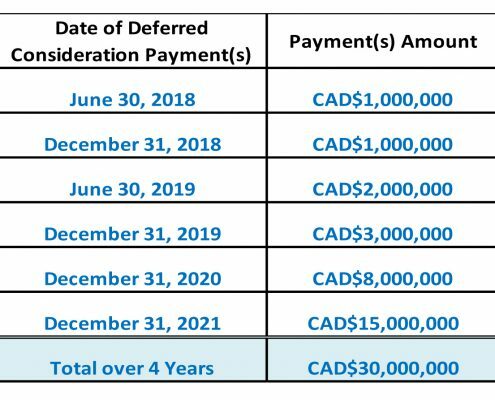 On February 18, 2018, Midnight Sun and Kam Chuen signed a Binding Letter of Intent and Term Sheet for the Company to acquire the remaining 40% interest in ZHLMIL for aggregate consideration of CA $30 million in cash payable over time, as illustrated below in Table 1.0 below (the “Acquisition”). The Acquisition will give Midnight Sun 100% equity ownership of ZHLMIL, which holds the Licences, and Kam Chuen will maintain a 2% net smelter returns royalty covering the Licenses. Completion of the Acquisition is subject to a number of customary closing conditions, including, but not limited to, the Purchased Shares not being subject to any encumbrances or transfer restrictions; TSX Venture Exchange conditional approval of the Acquisition; no material adverse change to ZHLMIL; and that any other required Zambian corporate or securities law approvals shall have been obtained. As security for the deferred consideration payments, a portion of the Purchased Shares will be placed in escrow by MMA with an escrow agent on closing of the Acquisition and will be held as security in favour of Kam Chuen. A proportionate amount of the Purchased Shares will be released to MMA as the deferred payments are satisfied. In the event of a payment default by MMA, the escrowed Purchased Shares will represent the sole and absolute recourse of Kam Chuen. As part of the definitive documents for the Acquisition, MMA and Kam Chuen will enter into a shareholder and governance agreement for ZHLMIL in the event of any reacquisition of the Purchased Shares by Kam Chuen following any default by MMA. Entities affiliated with Kam Chuen hold 9,437,500 common shares of the Company (representing approximately 12.32% of the outstanding shares), and as such, the Acquisition constitutes a “related party transaction” under Multilateral Instrument 61-101 – Protection of Security Holders in Special Transactions (“MI 61-101”). Accordingly, the Company is required to obtain “minority approval” (as such term is defined in MI 61-101) of the Acquisition at a special meeting of shareholders of MMA. Additional details regarding the date of the special meeting of shareholders of the Company to approve the Acquisition will be provided to shareholders in due course. The Licences consist of two individual exploration licences, 21509-HQ-LEL (formerly 14039-HQ-LPL) and 12124-HQ-LEL, covering over 506 km2 of surface area. The Licences are located in the Northern province of Zambia, adjacent to Africa’s largest copper producer, the Kansanshi Mining Complex, on the prolific Zambia-Congo Copper Belt. This news release includes certain statements that may be deemed as “forward-looking statements” within the meaning of applicable Canadian securities laws. All statements in this release, other than statements of historical facts, are forward-looking statements, including, without limitation, statements pertaining to completion of the Acquisition and any approvals required in connection with the Acquisition. Although the Company believes the expectations expressed in such forward-looking statements are based on reasonable assumptions, such statements are not guarantees of future performance and actual results or developments may differ materially from those in forward-looking statements. Factors that could cause actual results to differ materially from those in the forward-looking statements include: changes in market conditions, unsuccessful exploration results, changes in the price of commodities (particularly copper, cobalt, gold and nickel), unanticipated changes in key management personnel and general social, economic or geo-political conditions. Mining exploration and development is an inherently risky business. Accordingly the actual events may differ materially from those projected in the forward-looking statements. This list is not exhaustive of the factors that may affect any of the Company’s forward-looking statements. These and other factors should be considered carefully and readers should not place undue reliance on the Company’s forward-looking statements. The Company does not undertake to update any forward–looking statement that may be from time to time by the Company or on its behalf, except in accordance with applicable securities laws.